Country music star Trace Adkins and Pulitzer-Prize-winning author and historian James McPherson were on the Gettysburg battlefield today. They were helping to publicize the Civil War Trust’s “Campaign 150: Our time, Our legacy“, a project to protect 20,000 acres Civil War battlefield land over the next five years. 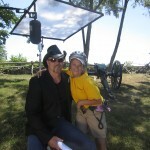 Sherry Rudisill stumbled across Trace Adkins on the battlefield while leading a Segway tour. She couldn’t help interrupting the tour long enough to run over to him and get this photo. It was a great day on the battlefield for Sherry!